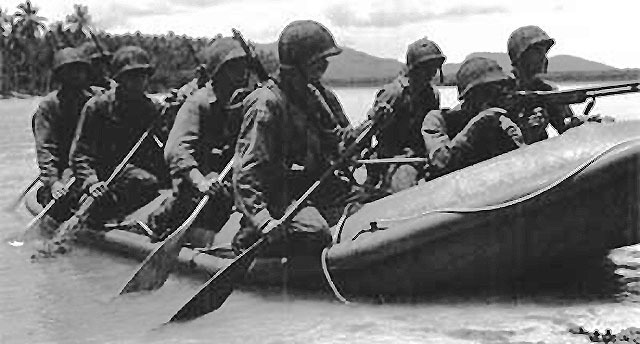 A Marine Raider Battalion was an elite formation specialized for commando-style hit-and-run raids. They were employed for this purpose at Makin in the Gilberts and Choiseul in the Solomons. They also played a critical role as line infantry in the struggle for control of Henderson Field on Guadalcanal. Marine officers visited the British Commandos in 1940, and "provisional rubber boat companies" were organized to test the raider concept in the fleet exercises of February 1941. Opinion in the Marine Corps was soon sharply divided into two camps. One camp, led by Holland Smith, pointed out that the Marines already considered themselves elite infantry, so that special raider formations would constitute a wasteful "elite within an elite." The other camp included Evans Carlson, a Marine officer who had closely observed guerrilla operations by the Chinese Communists and who had gained the ear of President Roosevelt while serving as commander of the White House Marine detachment. Roosevelt authorized the formation of Raider battalions, and his son, James Roosevelt, who was a Marine captain, became Carlson's executive officer in 2 Raider Battalion. Roosevelt later commanded 4 Raider Battalion. Because they were experimental formations, 1 and 2 Raider Battalions adopted their own organization and tactical doctrines. 1 Raider Battalion, under Merritt Edson, resembled an ordinary Marine battalion with additional training and equipment and composed of handpicked men. On the other hand, 2 Raider Battalion, under Carlson, was modeled closely on the Chinese Communist guerrillas and had a very informal structure that tended to erase distinctions of rank. Raider formations were deliberately kept small. For example, a Raider company was required to have no more than 143 officers and men, so that it could be transported by a single fast attack transport. Six companies (four light infantry, one weapons, and one headquarters company) made up a battalion, requiring a division of six APDs for their transport. The association between Raiders and APDs was close enough that Raider battalions were sometimes called "APD battalions" early in the war. Kelly Turner attempted to organize provisional Raiders battalions from rear echelon Marines at the start of the Guadalcanal campaign, but his orders were countermanded. However, two additional Raider battalions were activated in late 1942. Eventually all four Raider battalions were organized into 1 Marine Raider Regiment. As the war progressed and the Allies gained the ascendancy, skepticism about the Raiders grew. The Raiders had been used as line infantry far more often than as raiding units. It could not have helped that Holland Smith, who had opposed to the concept from the start, became one of the most senior and influential officers in the Corps. These highly trained battalions were therefore disbanded to provide cadre to reconstitute 4 Marine Regiment, which had been lost at Corregidor and was to be rebuilt out of especially distinguished units.